Introduction: This case report deals with the correction of a skeletal and dental class 2 div.1 malocclusion case. Materials and Methods: The patient was treated with .022 inch slot 3M metal bracket system, along with this the Jasper jumper was placed to help bring about the necessary correction of the class 2 skeletal malocclusion. Result : The necessary correction was achieved without the need for extraction. Conclusion: The Churro jumper is a helpful device to bring about necessary correction of class 2 malocclusion with acceptable results. B.D.S, M.D.S. Consultant Orthodontist, Former Senior Lecturer at Malla reddy Institute of Dental Science,Former Post graduate student M.S Ramaiah Dental College. Consultant Orthodontist, Former Senior lecturer Yenepoya Dental college, Former Post Graduate Student Yenepoya University. With the soft tissue paradigm shift, several factors are being considered during the initial diagnosis of an orthodontic case. The facial aesthetics are taking priority over the ideal dental norms. This helps to evaluate the final treatment plan and to address the issue of requirement of extraction of teeth. In 1998, Dr.Castanon et.al developed the Churro jumper 1. This fixed functional appliance was easy to fabricate and was to be an economical solution to the more expensive alternatives on the market. A 15 year old male patient reported to the clinic with the chief complaint of proclined upper teeth. He was diagnosed as having class 2 div.1 malocclusion with proclined maxillary anterior teeth with visible spacing and also a retrognathic mandible. 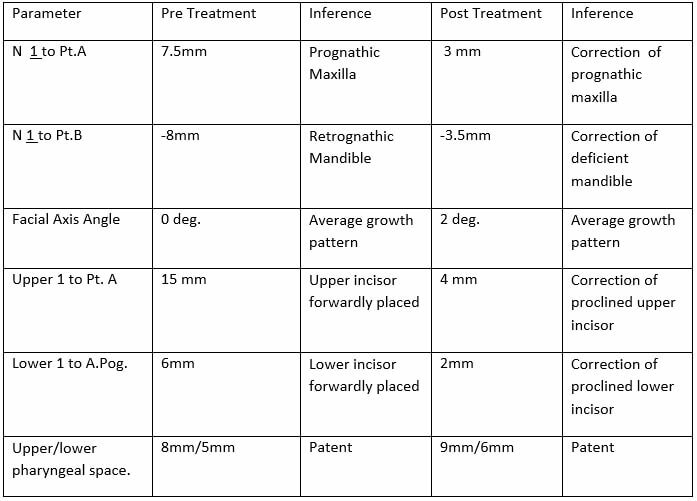 As the visual treatment objective was noted to be positive, mandibular repositioning was decided to be the best course of action with a non extraction treatment plan. An MBT prescription metal bracket system with an .022” bracket slot was used. The initial leveling and aligning was completed using the light gauge wires, followed by rectangular NiTi archwires and Rectangular stainless-steel arch wires. After the teeth were judged to have attained the proper tip and torque, the jasper jumper appliance was placed2. In about 2 months of placement of the jasper jumper appliance the patient had arrived at the clinic with a broken appliance and did not prefer to have it replaced. We were on the lookout for a more economical solution. The Churo Jumper seemed to be a logical substitutedue to its ease of fabrication and because it the suited the patient’s affordability. Therefore, the Churo Jumper was selected as a substitute to the jasper Jumper. The linear measurement was performed between the distal aspect of the mandibular canine and the mesial aspect of the maxillary first molar, the 10 mm was added to this length and was considered to the required length of the appliance 1. A wire of.028” was used to fabricate this appliance. About 15 coils were fabricated and placed between the maxillary first molar and the mandibular canine. A polyvinyl impression material was injected into the lumen of the coils with the help of a syringe. This step is performed in order to prevent pinching of the cheeks by the appliance. The distal ends of the pain arch wire are cinched distal to the molar brackets. The appliance is placed after the leveling and aligning phase is completed. The proclined upper anterior teeth were corrected. The mandible was repositioned and the final post treatment profile was favorable. We were able to achieve competency of lips. The final dental position was determined to be a favorable class I malocclusion. The anchor loss was negligible. 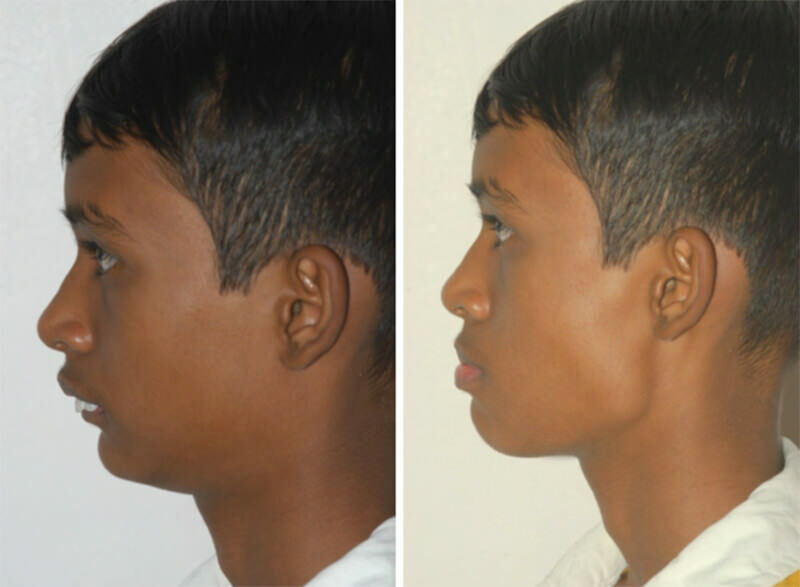 According to a research done by Bjork.et.al, any increase in the vertical facial height for a Class II malocclusion patient would prove detrimental to the patient as the mandible rotates posteriorly and this causes worsening of the Class II pattern3. Therefore, if any orthodontic appliance was to cause a counter clockwise rotation of the mandible, it would help with the correction of the Class II malocclusion and prevent it from worsening. This is the basis of correction of the Class II malocclusion with the help of functional appliances (fixed or removable ). When the patient arrived to the clinic with the pre existing Class II malocclusion and incompetent lips several treatment plans were considered. Considering the patient’s age and a positive Visual Treatment Objective (VTO), a non extraction treatment plan was proposed with the help of a fixed functional appliance. Several appliances were considered such as the Forsus appliance4, the Eureka spring5 and finally a decision was taken to use the Jasper Jumper appliance. During the initial assessment period, it was noted that the appliance was producing favorable results. After the patient broke the appliance, he was advised for replacement of the appliance but he found the solution expensive. Although the fixed functional appliance therapy is effective and overcomes the shortcomings of patient compliance in traditional myofunctional therapy, they have certain limitations/. The constant breakages and difficulty in patient acceptance are some of the problems faced by the orthodontic practitioner. The Churo jumper is an economic and reliable substitute for the more expensive fixed functional appliances in the market.